We were contacted by a client who was looking to clean up a section of their warehouse. They had just signed a contract to manufacture some medical grade equipment and needed a clean environment. Previously, the area had been used for warehousing, so it was far and away from being used as a clean area. Firstly, the ceilings and structural steel were covered in heavy dust. To remove the dust, we used high powered air cannons. And once the dust was completely removed, we applied a specialized DTM product over all the steel and ceiling panels. After the ceiling, it was time to brush and roll the same material on the CMU block walls. And once the painting concluded, it was time to install the floors. The room very hot, and we an industrial thermometer to verify the best time of day to install the floors. 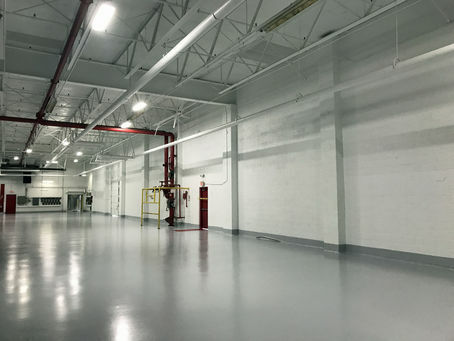 Once it we confirmed an acceptable time, We installed a 75mil hybrid flooring system that included urethane cement, epoxy, and aliphatic urethane. Overall, the project was completed in 1 month and completed before the customer's drop dead date.